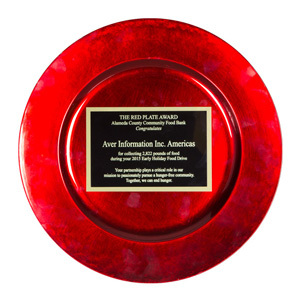 AVer Information Inc., a leading provider of innovative educational and business technology solutions received 'The Red Plate Award' from the Alameda County Community Food Bank for donating 2,822 pounds of food during the 2015 Early Holiday Food Drive. AVer has committed to teaming up with the nonprofit organization to help end hunger in the Bay Area community since 2013. "I want to thank Aver Information Inc. Americas for their generous and enthusiastic food drive in support of our work. Its good people like you who make a positive difference for the community, and we deeply appreciate your involvement." expressed Katherine Avila of ACCFB. Alameda County Community Food Banks serve 49,000 Alameda County residents every week with almost half the residents being children and teens. Resources such as these food drives are vital for neighbors in the community facing hunger. "We are honored to partner with the Alameda County Community Food Banks to serve the community," stated Arthur Pait, President of AVer Information Inc. Americas. "Corporate Social Responsibility is something we strongly believe in and practice at AVer. We will continue to do whatever we can to help our community as an organization." This year, AVer plans to partner with ACCFB for the 2016 Early Holiday Food Drive and continue efforts to end local hunger in the community.